The man who officially brought carp to North America: Dr. Spencer F. Baird, head of the United States Commission of Fish and Fisheries. In the early 1880s, Baird was receiving 2,000 letters a year from citizens requesting carp for private ponds. Any reference to 'Carp' on the American Carp Society website, or in any American Carp Society literature, is solely referring to Cyprinus Carpio (Common Carp, Mirror Carp, Leather Carp, and Koi). The recent imports (mid 1970s) of Big Head (Hypophthalmichthys nobilis) and Silver Carp (Hypophthalmichthys molitrix) that are presently making negative headlines in the mid-west/Mississippi water shed and encroaching the Great Lakes are not in any way related to Cyprinus Carpio, the subject of this website. The account below was researched and written by Rob Buffler & Tom Dickson in the late 1980s and later published in their book, Fishing for Buffalo. We hope you enjoy and learn something from this fascinating and factually correct account of the common carp's history here in North America. People long been singing the praise of carp. In China and Japan, this strong, intelligent fish has been the symbol for notability, honor, and courage for centuries. In Europe it was a food reserved exclusively for European royalty during the middle ages, and today, it is still prepared meticulously by Cordon Bleu chefs in that continent’s finest restaurants and hotels. In Britain, more anglers pursue carp than any other species. An English “carpman” fishes from 1,000 to 2,000 hours a year, and calls it a good season to hook and land a dozen of the wary fish. Yet here in the United States, the carp, also known as common carp, German carp Israeli carp, German Bass, bugle mouth, brown bass, hoselips, Is widely ignored. And when noticed at all, it's held in disdain. Why do most American anglers look down on the fish esteemed throughout the rest of the world? Why do they grimace at the thought of eating a fish served in fancy Parisian hotels, and roll their eyes at the suggestion they pursue a quarry prized by millions of anglers across the Atlantic? The relationship between carp and American anglers began 4,000 years ago, when Chinese first noticed carp in it's native Yellow River, which runs from west to east through central China. Each spring carp make a Spawning run all the river’s tributaries, a long and arduous Journey requiring fish to leap barriers and burrow up rapids to reach their destination. The Chinese, admiring this dogged display of courage and perseverance, adopted the carp as a symbol for strength and nobility. They also begun raising carp for food and ornamental displays. As is still done today, certain species of carp were held in rearing ponds outside homes and fattened for the table. Other species were bred to exaggerate colors that made them attractive pets in garden Ponds. Carp are native to China, where the whiskered fish are admired as a symbol of courage and nobility. Carp flags and kites such as this one are still flown in China and Japan to bring good luck and strength to newborn children. The Japanese, heavily influenced by Chinese culture, began using the carp symbol in the 10th century. Throughout the Japanese Middle Ages, carp adorned the banners carried by the samurai to symbolize strength of this warrior class. Carp flags and kites fluttered in the wind to represent fish swimming up stream flow at boy’s festivals to inspire young men went to overcome obstacles and reach their goals. Parents still fly the carp flag at births to bring their children strength. In Asia, the carp remains a symbol of honor and courage on pottery, drawings, screens and paintings. No one knows exactly the original range of carp, other than this fish is native to Asia and the Asian watersheds of the Black, Caspian, and Aral seas. A hotly contested subject of debate among carp historians is whether the species is native to Weston Europe. One argument says no because there are no records showing carp to be in the western part of the continent before the Middle Ages. Others say that because the fish is known to be indigenous to the Black Sea, it could have traveled up the River Danube as far as Germany. That the spread of carp throughout Europe increased during the middle ages is accepted by all carp experts. Nobility and clergy demanded meals of carp. The fish were held in ponds in the cellars of monasteries, where with whether they were fattened with milk and bread until killed for the table. As the standard of living the average European and Englishman improved, so did the availability of carp. Carp became food of the bourgeoisie, and who emigrated to the New World left Europe having developed a taste for the rich fish. Imagine the surprise of the well-to-do arrivals to America in the mid-1800s who asked for carp at restaurants and fish markets and found the fish didn't exist here. Jews, accustomed to preparing carp for Geifilte Fish, were aghast. So were many Scandinavians, Belgians, Austrians, French, and Germans who served carp at weddings, Christmas, New Year's, and birthdays, and had assumed the land of milk and honey would have carp as well. Incensed, they wrote to the new government and demanded that carp be made available. In 1876, Dr. Spencer F. Baird of the Smithsonian Institution, head of the newly formed United States commission of Fish and Fisheries, began receiving requests from citizens for carp. By 1880, the commission was getting 2,000 letters a year. These requests were timely; Fisheries Commissioner Baird was looking for fish to import into the new country. During the mid-1800s, native fish were being netted by the millions of pounds from the Illinois, Mississippi and Ohio rivers and shipped to markets in the burgeoning cities along the East Coast. At the time, Fish were seen as a resource like timber and coal to be harvested and sold. The commercial depletion of fish coincided with indiscriminate logging that was turning hillsides bare, and allowing rains to wash the exposed top-soil straight into the streams and rivers. This stilted spawning in gravel used by fish such as suckers and Walleyes, and hid food from sight feeders such as bass and burbot. Wetlands along the river bottoms were leveed and drained, depriving northern pike and buffalo of spawning grounds. Channelization (the dredging of navigational lanes in the rivers for the passage of ships) eliminated holes, drop-offs, breaks, riffles, snags and other fish protecting structures and rivers and turned them into massive featureless canals when fish couldn't find anywhere to hide or locate small fish to eat. 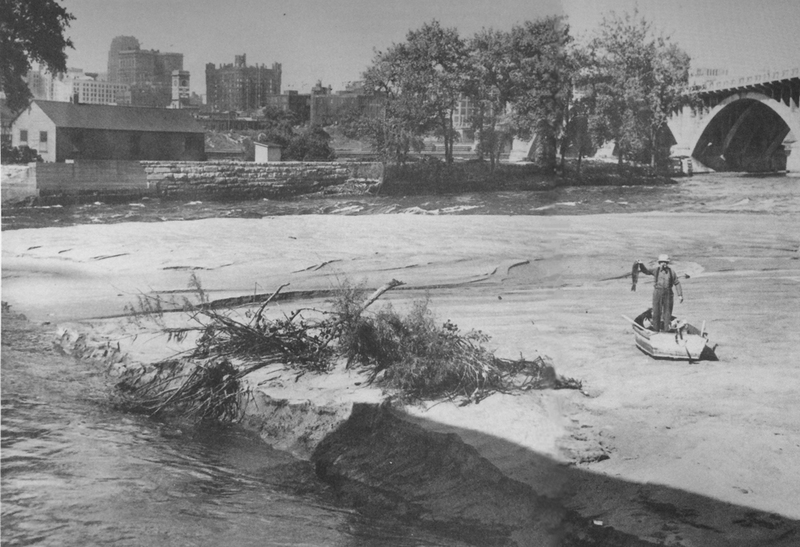 If the netting and changes in the river and landscape weren’t enough, towns were popping up along the rivers and dumping their waist straight into the water. Bacteria from human and animal effluent ate up oxygen needed by many species like they greater Redhorse, sauger, and drum, which began to die out. The nations leaders became alarmed that the rapidly expanding country might soon run out of a fisheries resource. In 1871, President Grant appointed a fish commission to oversee the country’s fisheries; it’s first task was to find a way to shore the flagging fishing stocks. Although the commission members knew the nation’s native fisheries were being ruined by human development, it would've been politically unwise to recommend that the pollution, over-fishing, wetland drainage, and logging cease. Instead, the federal government decided to find a new fish species that could replace or at least supplement those dying out. Baird wrote to Europe and received information on a variety of fish, notably the carp. He was impressed with what was being done in Europe and Asia, where carp was a cash crop rivaling grain and livestock in sales and protein content. In his 1874 report, Baird wrote that the common carp would thrive better than most native fish because it fed on vegetable matter. While only partially correct (like trout, carp eat mostly insect larvae), such a revelation was enough to encourage more research. Two years later, Baird noted in another report further benefits of carp such as rapid growth, adaptability, harmlessness to other fishes, and good table qualities. Since sport fishing wasn't popular at the time, the commission didn't even need to mention the carp’s strength, size, and sporting qualities to convince Congress to appropriate money to import carp from Germany and begin a program of raising and distributing the fish to points throughout the westward expanding nation. In 1877, the commission imported 345 common, mirror, and leather carp and placed them in ponds in Baltimore, where they were raised by Maryland's Fish commissioner, T. B. Ferguson. The next year, some of these fish were transferred to ponds near the capitol in Washington D.C., where they soon had produced over 6,000 carp fingerlings that were shipped to 273 applicants in 24 states. The spread of carp in North America had begun. The US government can’t be credited with the first introduction of carp to the continent, however. By the time the bureaucrats finally got around to importing carp, a citizen of the Golden Bear State had been raising the species in his backyard for 5 years. Julius A. Poppe, of Sonoma, California, had taken matters of fish farming into hide own hands and in 1872 had gone to a commercial operation in Reinfield, Germany to purchase 83 carp. When his ship reached California in August of that year, only 5 carp had survived. But they were hardy survivors. The handful of 6-inch fish he placed in a pond at his home had grown to 16 inches long and produced over 3,000 young by the following May. Various publications of the time promoting the advantages of raising carp. It didn’t take long for others to follow Quincy’s advice. Within the next 2 years, every major river in Illinois had been stocked with the newly imported fish. The city council of Ripon, Wisconsin passed an ordinance prohibiting fishing in all waters within the city limits to protect the recently stocked carp. Carp can live and spawn in practically all types of water, so it didn’t take long for them to dominate many lakes and rivers. After only 4 years of being stocked there, carp were being caught by commercial anglers in the Illinois, Missouri, and Mississippi rivers. Dr. Bartlett reported that in 1893 one fisherman from Illinois caught 27,000 pounds of carp in two 700-yards seine hauls. In 1884, 453,000 pounds of carp were caught in the Upper Mississippi River alone. At first the profusion of carp met with a receptive market. Sweeny wrote in his 1888-90 report that carp “are now to be found almost daily on the stalls of the fish dealers of St. Paul and Minneapolis and to the great satisfaction and gustatory enjoyment of many of the foreign-born citizens.” The new arrivals pouring into the United States snatched up carp from fish stalls in cities like St. Louis, NewYork, Boston, Chicago, Kansas City, and Philadelphia, too. For a while, the availability of carp to the huddled masses didn’t lessen its appeal to the rich, who still considered the fish a delicacy. In the late 1890s, expensive hotels and restaurants in New York City were serving “Carp in Rhine Wine Sauce,” a dish costing more than halibut or Kingfish. But sometime around the turn of the century, carp started to lose favor with the well-to-do, who presumably began noticing on their stroll to the office that the have-nots were carrying the same species they had recently eaten at the Waldorf. America’s upper class quietly switched from eating carp to fish less accessible to the poor. Meanwhile, many people were noticing that American-bred carp didn’t taste as good as those raised in Europe. There, the raising of carp was a science, refined over thousands of years. The fish were carefully crossbred like cattle and hogs to create superior-tasting strains. In the late 1880s, the Austrian princes of Schwarzenberg, at the time the most extensive carp farmers in the world, had ponds that collectively covered 20,000 acres. The fish farmers in the United States, on the other hand, were mostly amateurs who tried to make a quick buck by dumping carp into anything that held water. Their shallow ponds filled with stagnant water produced muddy-tasting carp. Most states stopped stocking carp in the mid-1890s. A majority of the fish farmers had given up the carp trade and moved on to more lucrative ventures. Either they couldn’t keep the carp alive in ponds, produced poor-tasting fish, or couldn’t compete with commercial anglers, who were hauling carp in from public waters that had been stocked intentionally or accidentally. By the early 1890s, midwestern commercial anglers each year were shipping hundreds of tons of carp to the eastern states. Fish farmers couldn’t begin to raise a fraction of that. Fetching only 3 cents or 4 cents a pound (a far cry from Poppe’s boast of a dollar a pound), carp had become so plentiful they had literally outgrown their value. By the 1920s, the Mississippi river had become one of the world's best carp fishing hotspots. This angler, beached on sand flats below the 3rd Avenue bridge in Minneapolis, holds a carp recently caught in the river. About this time, people began noticing that carp numbers were exploding in rivers and lakes, the populations of game fish hadn’t rebounded at all, and in fact had continued to deteriorate. Why, they wondered, are carp doing so well and bass and sauger so poorly? Standing on clear-cut hillsides with a bucket of garbage in each hand, they looked down on the rivers, saw carp swirling happily in the mess humans had created, and made a correlation — albeit the wrong one — between the rise of carp and the fall of game fish. Either ignorant of or blind to the damages they themselves had wrought on the landscape, people looked past the dredged and straightened channels, drained wetlands, eroded river banks, and waters laden with human and industrial waste, saw carp rolling in the shallows and accused them of wrecking the water. The carp was the perfect scapegoat. It was foreign. It was thriving. And it couldn’t defend itself. The claims against carp were not without foundation. Carp do muddy waters and up-root vegetation searching for food. They have dominated some fisheries, crowding out species like bass and bluegills and increasing turbidity to the point that walleyes have a hard time seeing food. In several lakes in the Mid-west, carp have been proven to uproot vegetation so much that wave action increases, causing even more turbidity. This blocks sunlight from reaching underwater plants, turning a shallow lake into a bowl of muddy water. With no food to eat, ducks move elsewhere. Yet such instances are relatively uncommon. Carp are found in almost every fishery in the nation, and most still have plenty of good fishing. In most lakes, carp reach a balance with the other fish species. Most fisheries scientists who’ve studies carp agree that changes in land use have hurt the game fish more than carp ever could. Carp are simply able to survive in water that is slower, warmer, and more turbid and polluted than most other fish can stand.